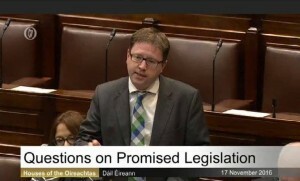 In the Chamber yesterday I queried the operation of Tús and Community Employment schemes. Too often a worker is willing and able to remain placed with the same institution (usually a charitable or community organisation like Tidy Towns or McAuley Place) but is forced by “job-path” to spend a year in limbo and seeking alternate work. This sees both the organisation and the individual losing out on an arrangement that gives the the individual a job they enjoy and the organisation an extra staff member. This all stems from changes made to the scheme last August when it was outsourced to private providers. Following my question Minister Varadakar has agreed to review the operation of the scheme.